We’ve said it before but it bears repeating: CNN’s Don Lemon is enjoying a moment. Coming off some excellent political reportage in Iowa (which included both a terrific on-the-fly interview with a strolling Sarah Palin AND getting elbowed into a golf cart by Marcus Bachmann. But the coup de grâce for Lemon’s weekend work came when he returned to CNN’s NY studio and delivered a “No Talking Points” segment that illuminated Michele Bachmann‘s overreliance on talking points and lauded Palin for her improvised candor. 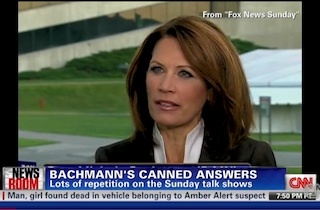 In iowa, many of us tried to get direct answers from Michele Bachmann. Instead we got caught up in media scrums where we were pushed and jostled. It happens. But when campaign staffers and family members do the pushing it becomes newsworthy. Why? Anyone familiar with politics tells you it’s an indication of how the campaign could conduct business once the candidate is in office and the voter should be made aware. He then followed some commentary from Donna Brazille and Alex Castellanos with an example of another potential GOP candidate who also has huge support from the Tea Party, Ms. Palin. The clips from her interview with Lemon reveal a likable and candid individual that is a far cry from the occasionally strident person who almost exclusively shows up on Fox News. In fact, if we were to see more of the version of Palin that Lemon interviewed below, one might expect that she’d enjoy far more support from moderate independents who see her only as the cartoon character as she is so often portrayed by many in the media, fairly and unfairly.